GoodJunk is my first iOS application to be released on the App Store. It's an iPhone game made with SpriteKit. Translation Tester let you test the translation files of your CodeIgniter applications. Easily detect if there is missing or extra strings. Compare the original text side by side with its translation to check the quality of the translation. LaFibreArtistique.com is a site for cross stich fans. 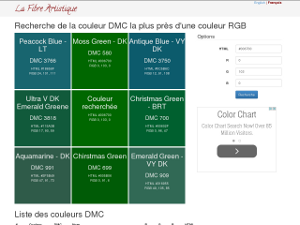 Easily find the color you're looking for with the DMC color list. Even more interesting, find the closest DMC color mathching an RGB color. Ideal for finding the right colors for your custom designs. 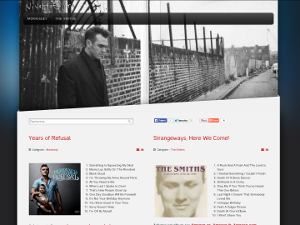 VivaHate.org is a tribute site to Morrissey and his old band The Smiths. Browse the complete discography with pictures of the albums sleeves and lyrics of all the songs. I've been a developer for over 25 years. 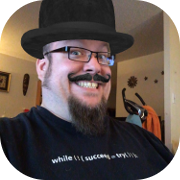 I worked for several years with C on Unix, then I made a lot of web developement, and now I also make iOS applications. My first application is the game GoodJunk, available on the App Store. What I know and what I'm learning right now.